Jonathan Webster wrote: Then what about having a cheaper option? In Scotland and South Africa, potential armigers can apply for Arms consisting of just the shield and motto for a fraction of the price of a full achievement. In England and the rest of the UK outside of Scotland, you have to pay full price, including the crest. In Scotland, matriculating just the shield costs about £1000. In South Africa, it costs just £300. Perhaps if the College of Arms introduced a similar option more people would be encouraged to apply. After all, they could always apply for a grant of a crest later should they so wish. Here's the way the Canadian Heraldic Authority breaks down its pricing. - Processing fee $435 plus tax. - Basic design $325 to $1,200 depending on complexity. - Calligraphy and artwork for Option I (computer generated certificate and separate painting of the arms), $875 to $2,000. - Calligraphy and arwork for Option II (hand lettered and painted letters patent, a la College of Arms), $2,225 to $3,500. So the total could hypothetically run anywhere from $1,635 (simple design with Option I) to $5,135 for complex design with Option II. The CHA website advises that a petitioner should expect to spend at least $2,400. My understanding is that the CHA is required to set its pricing to recover the costs of running the operation. I would assume that includes salaries, but don't know that for a fact. Lord Lyon's current (April 1, 2013) price for a new grant of personal arms with crest and motto is £2,236 ($3,480). As Jonathan says, a matriculation is only £1,012, but that presupposes the existence of a previous grant. As I recall, Lyon Court submits an annual accounting of costs and income that is a matter of public record, but I have no idea where one would find it. For comparison, the last price I saw for an Irish grant was €3,300 ($4,400) as of a few years ago. The College charges £4,950 as of this January, which equates to $7,500. 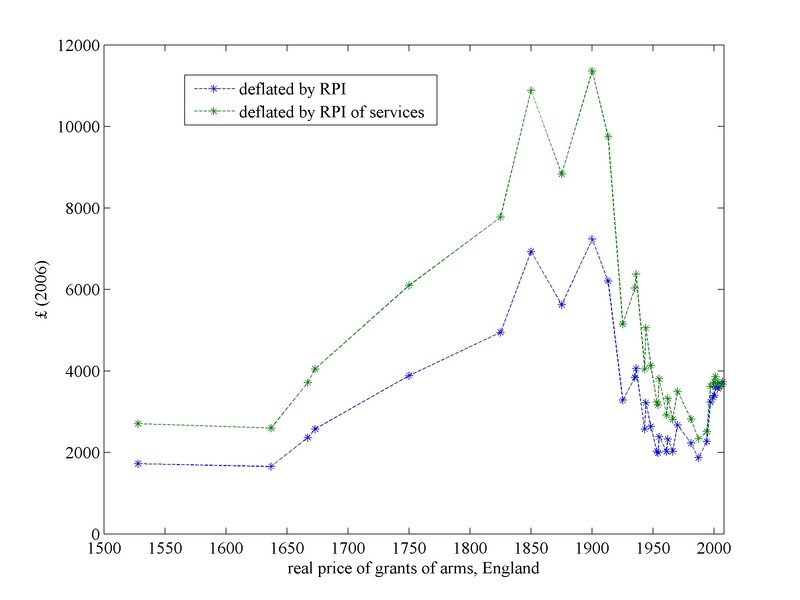 As a matter of interest, Francois Velde has a graph of the cost of English grants from 1526 to 2007 adjusted for inflation at http://www.heraldica.org/topics/britain ... t_fees.jpg. It is based on research that he, Derek Howard, and I posted on rec.heraldry five or so years back. Note that unlike the College, there is no price differentiation among individuals, corporations, and other institutions. [quote="Peter Harling"]At a meeting yesterday I had the opportunity to have a chat with Thomas Woodcock (Garter King of Arms). Now while the situation I outline here does in no way affect my own personal circumstances, I do feel quite concerned for armigerous families that have produced only daughters! Consequently, on the marriage of the said daughters; bearing in mind the husbands of the marriages are not armigers; the family from hence forth will lose the right to bear their mothers arms. That is of course unless one goes to the great expense of a Royal Warrant! I put this point to Mr Woodcock who immediately suggested that the wife should encourage her husband to apply for a grant of arms. Fine! problem solved (quartered arms eventually). But! Not every husband can afford the £5,000 pounds said I. So I suggested .... What if the wife kept her maiden name and any child born of the marriage hyphenated with mother and father's surname, surely this would get over the stumbling block in Mr Woodcock's objection that the arms should stay with the name! At this point Mr Woodcock warmed a little to my proposal and to my surprise said he would discuss it with the other heralds. Now I don't think anything will come of it. But you never know! One year later, hear is another (who has only now got into the letters pages of this firm). No thoughts here, just an account. Some two centuries ago a gt-gt-gt-grandmother of mine died. A little over 40 years later she became a co-heiress in her issue. Roughly 15 years after that she became the sole heir in her issue. Alone of four children she was the only one to have issue and indeed only one of these latter had issue herself. The same g-g-g-gm had married a chap who died about 10 years after her. He was not armigerous and we know virtually nothing about him. Said g-g-g-gm had a father who died 20 years after her. He drew up a names and arms will. This worked OK while his pad descended to his son and then his eldest daughter, the senior co-heir. But then in 1868 his nearest descendant was a granddaughter who had no arms herself, being the daughter of a non-armigerous chap, above, and had married a chap also with no arms. There was enough cash in the kitty for some solicitor, I presume, to decide that the College of Arms should be consulted and paid to do their bit. So they, the CofA, ignored the intervening generation with no arms and got a royal licence drawn up to quarter the Trotter (Del-Boy's mob?) arms with the arms of the husband of this sole heir, the granddaughter of the original name and arms testator. Curiously, at the time the RL was signed, this non-armigerous husband did not have any granted arms but some arms were named and exemplified in the RL; further as he was not even a Trotter he was awarded a canton argent to go in the Trotter quarters. A month later, this previously non-armigerous husband, a Mr Brown but already Mr Trotter South of the Border, was granted by Lyon the arms he had been said to already own in the RL, with Lyon obviously working in a differently timed universe. So that is the English precedent for a generation whose chappie does not have (or will not or died without) any arms. Just grant them to the grandchildren and ignore all problems. I am the heir general to these curious arms. I could even change my name and bear the undifferenced original arms of the Trotter grant, by Lyon, of 1803. Financial prudence, if not other reasons, forces me to abstain. PS: When previewing this, the quoted section did not appear to be quoted but I hope it comes out alright when I press the Submit button. Last edited by andrewkerensky on 18 Apr 2015, 23:53, edited 1 time in total. andrewkerensky wrote: When my arms are finally complete and registered with the Bureau of Heraldry in South Africa I just assumed i'd past them on to my two daughters if they wanted them. I don't have a son to pass them on to. I did suggest if they did get married in the future they could double barrel their surname if they wished to continue my surname and arms. I doubt they will but you never know! Of course, since you are assuming arms rather than obtaining an English Grant - I suppose your could pass them on as you wish. Or, when you daughters get married, if they don't want to be double-barrelled or their husband is not armigerous, they could always assume arms based heavily on yours and be armigers in their own right under their married names.